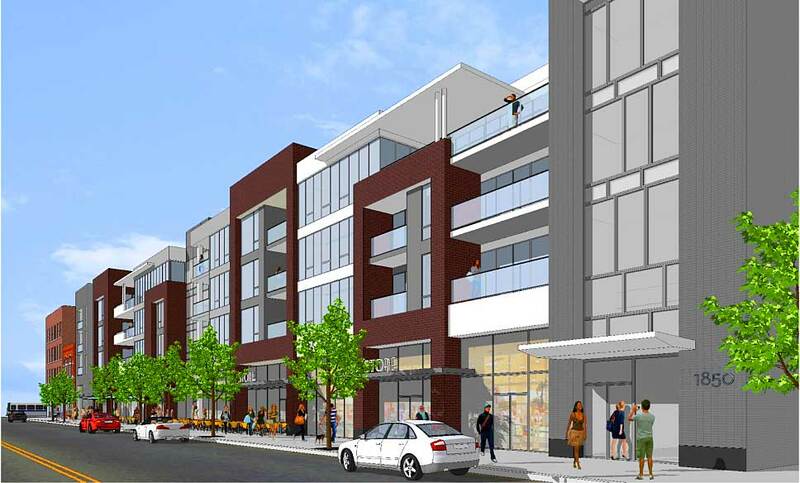 An architect's rendering shows proposed units west of Tecalitlan Restaurant, 1814 W. Chicago. A developer will unveil plans Monday for 63 apartments above first-floor shops at 1822-50 W. Chicago Ave. Representatives of 1850 FCR LLC, a group led by Fifield Realty Corp., will make a presentation to the East Village Association board at 6:30 p.m. in Leona's Restaurant, 1936 W. Augusta Blvd. Drawings submitted by PapageorgeHaymes Partners last month indicated 70 units on three floors, above 14,000 square feet of retail space. The developer now projects 9 studio, 33 1-bedroom and 21 2-bedroom apartments. The masonry structure is ornamented with metal canopies and glass-enclosed balconies. Apartments average 794 square feet, a density that would require the 12 original lots to be rezoned to B3-3. The upzoning from B3-2 also would allow construction higher than 50 feet. Drawings show a 54-foot roofline, compared with neighbors Pentecostal Redeeming Church at 35 feet and Tecalitlan Restaurant at 34 feet. Parking would be accessed from the alley behind Commercial Park at 1845 N. Rice St., with a loading dock and 16 retail spaces west of 71 spaces for renters  27 at ground level and 44 on a mezzanine deck. The two vacant parcels are the onetime site of AAA Distributing Co. The automobile warehouse was razed last year after a project was shelved to renovate the existing complex as the Chicago Bowl concert hall and restaurant. This year the site has figured in city action to extend pedestrian-friendly zoning along Chicago avenue and discussions to expand Commercial Park. Planning chair Scott Rappe told EVA members this week that current owner Ken Kosinski had rejected a potential land swap for the 13th District police headquarters. The station house at 937 N. Wood St. is slated to close this month with demolition to follow. Sounds almost perfect. I liked the rumor of a Trader Joe's going in there, but one strore-front that long would be a too coarse-grained for a pedestrian. Another 200 people on the street in this dead spot on Chicago will do a lot to liven up that block.